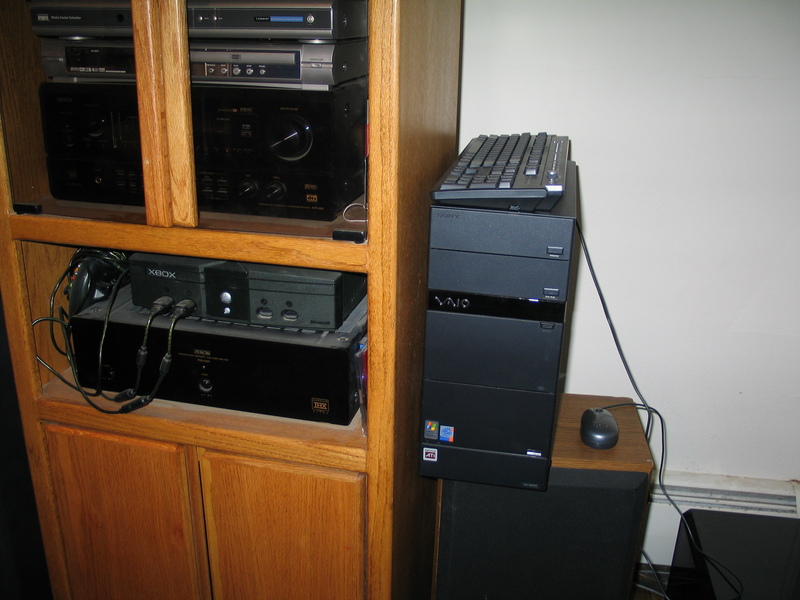 Last week I received a Sony VAIO RA920G Desktop PC running Microsoft Media Center 2005 (MCE) as well as the new Linksys Media Center Extender (MCX). The Sony VAIO RA920G has some cool features including an advanced liquid cooling system and enhanced acoustic technologies that make it virtually silent. This is perfect for my family room home theater setup -- after all you don't want the sound of the PC's fan spoiling the DVD movie watching experience! Of course, I also have a Linksys Media Center Extender (MCX) which "wirelessly" extends the PC to allow me to have the PC and the TV located in different rooms in my home, thus negating the concern about noise from the PC. Media Center Extenders (MCXs) transmit the audio/video over 802.11a or 802.11g wireless networks. Essentially, you use your Microsoft Media Center Edition PC (MCE) as the central repository for all of your media, and then use a Media Center Extender (MCX) as an access device placed wherever in your home you want to enjoy that content. Thus, your PC can reside in the den or computer room, but you can watch your recorded TV shows in the family room. You simply point the included remote at the Linksys MCX and the familiar Microsoft MCE 2005 interface appears. Then you choose the function you want (live TV, recorded TV, music, photos, etc. 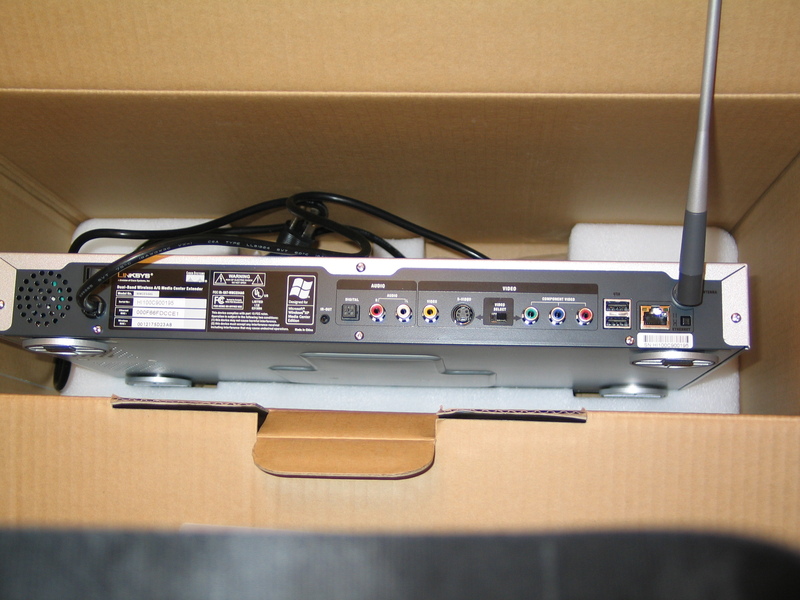 ), and the content is streamed wirelessly (or via an Ethernet cable) to the Linksys MCX which is connected to your TV. 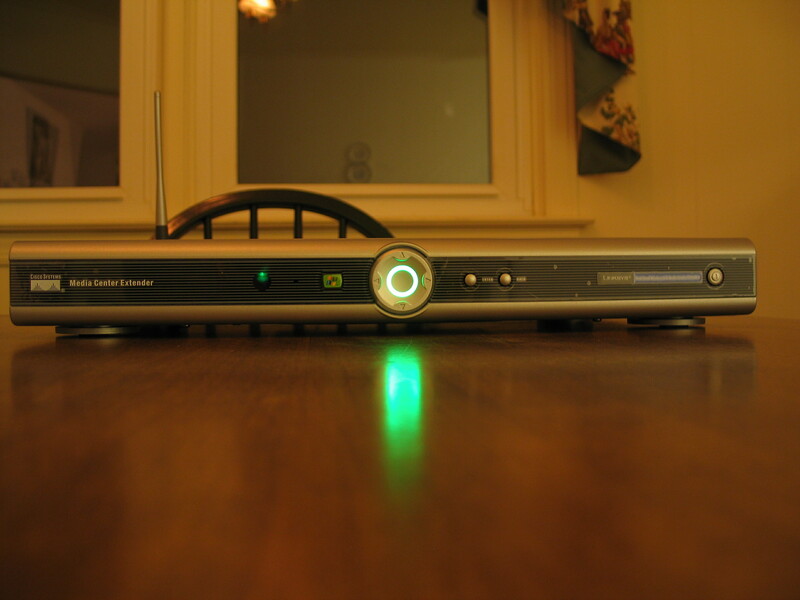 Depending on the horsepower of your Media Center PC, it can host up to five Media Center Extender devices. I wasn't sure if MCE 2005 (within the MCE interface not the Windows desktop) or the LinkSys MCX could support VoIP applications or not, so I looked at that as well. Here's the contents of the LinkSys Media Extender box sprawled out on my kitchen floor. Here's an interesting photo because it shows the "scale" of the LinkSys Media Center Extender - I used a pen placed on top of the MCE to show the scale. When I first researched the LinkSys MCE and looked at photos online, I thought for sure it was no more than 6 inches wide, but it is indeed much bigger than that. 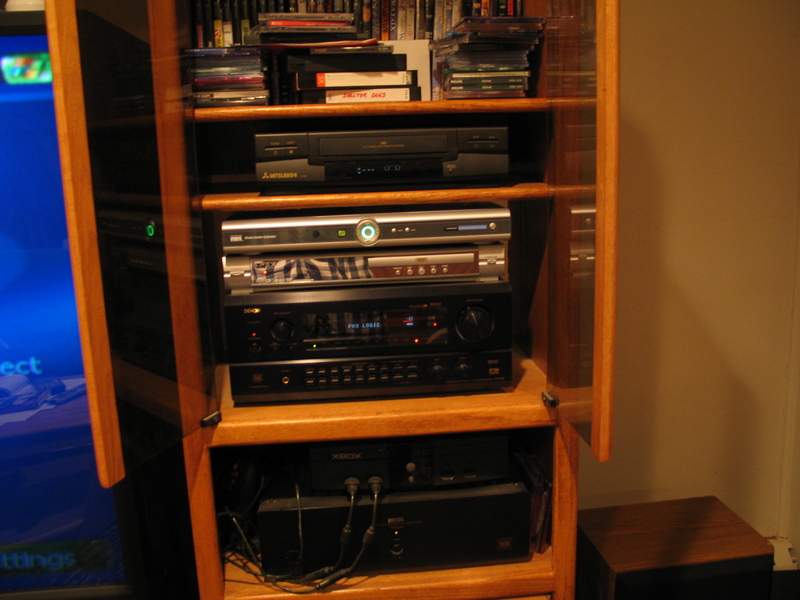 Still, the unit is quite thin so it slid quite nicely into my home theater cabinet. I opened the unit and there is a lot of empty space in the unit, so it's too bad they didn't shrink it down. Although, I suppose if they make it smaller, it would make it more difficult to balance/position other A/V equipment on top of the MCE. Here's the LinkSys Media Extender installed in the downstairs family room and located in my home theater cabinet sitting on top of an Apex DVD player which sits on top of a Denon AVR-4800 receiver. The next shelf down holds an Xbox and a Denon POA-5200 amplifier (gives me two extra channels for Dolby Digital 7.1 Surround Sound). 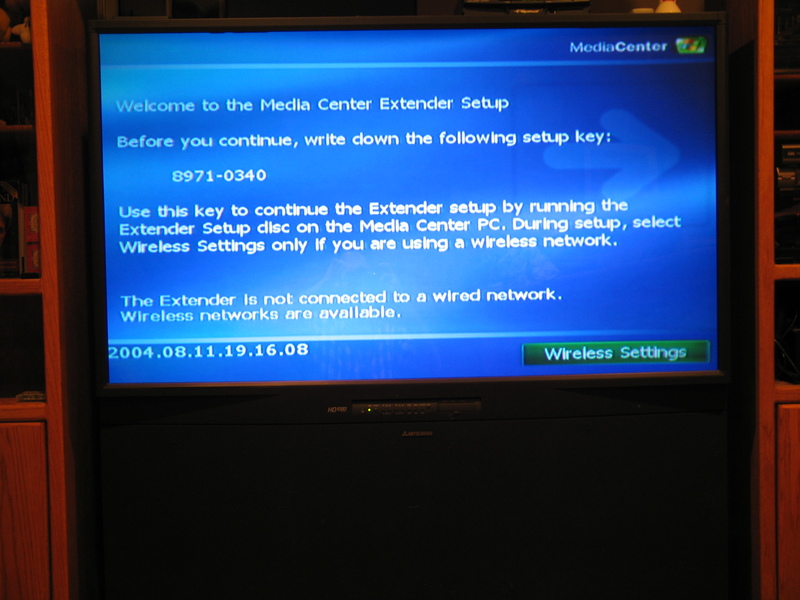 When I first booted-up the LinkSys Media Center Extender, the Mitsubishi 65" rear-projection TV displayed this screen, which includes a unique setup key. 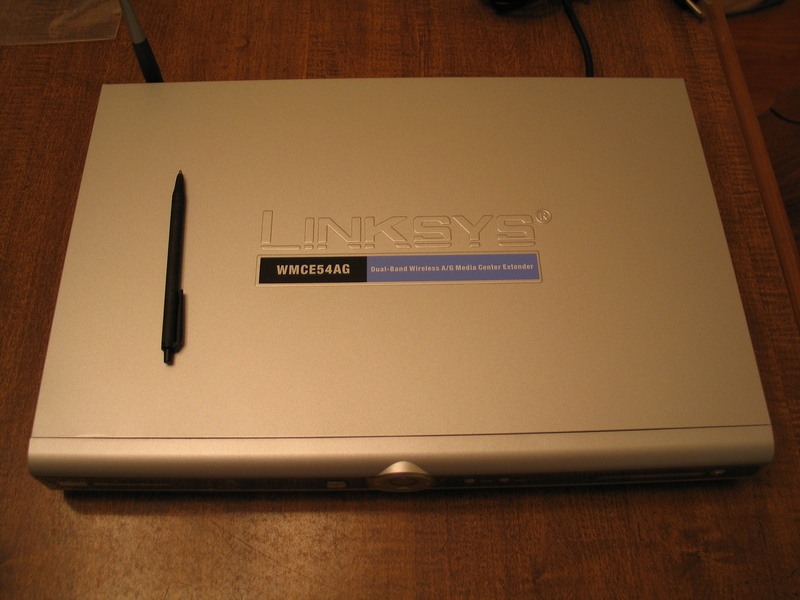 This setup key gets entered into the LinkSys software which must be installed on the Media Center PC before the MCX will work. This ensures that your MCE is only sharing content with the extender device in your home. I installed the software, entered in the setup key, and then went back to the television to see if I was good to go. Before I get into whether it worked or not, here's a screenshot of the wireless signal strength for determining if deploying a wireless solution in your house is going to work. If signal is poor, you are better off snaking an Ethernet cable from the Media Center Extender to your home router. Fortunately, in my case, the distance between the router and the Media Center Extender was only 5 feet, so as seen in this photo, the signal strength was very good. 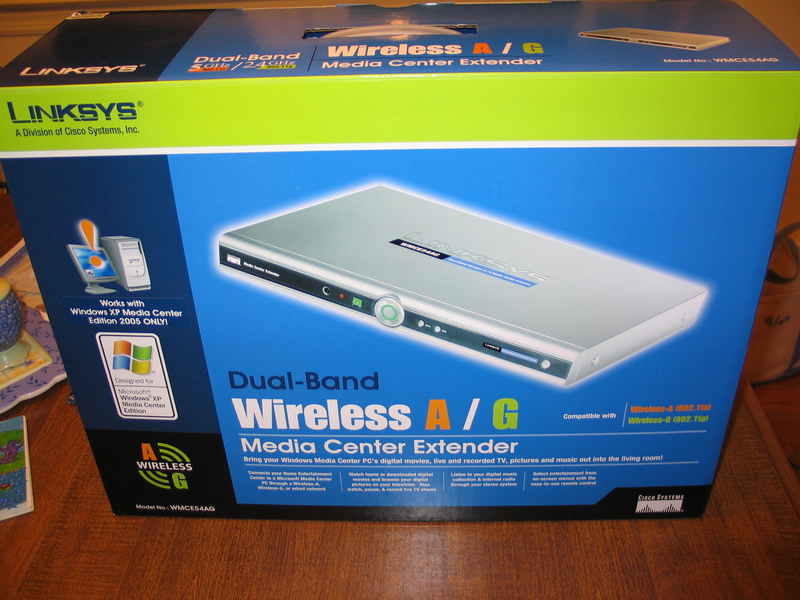 Media Center Extenders can operate over wired Ethernet, or 802.11g wireless or 802.11a wireless. So what is going over the network? Essentially it's a remote desktop connection that's sending out a DirectX application along with the streaming raw video feed that is transported alongside the RDP connection. The higher the video quality, the more bandwidth it consumes. I had no problems with my 802.11g network, but you may get better performance and less interference using an 802.11a wireless network. Ok, now down to the nitty gritty. Everything "in theory" was hooked up correctly. Cross my fingers, changed my TV's input signal to Input 2 and ... Woohoo! I could access My Videos, My Pictures, My TV, My Music, and Radio. The screenshot to the left is a screenshot captured via software from MCE 2005's interface and not the LinkSys MCX. I did this since the interfaces look nearly identical and I couldn't capture a "screenshot" from the MCX - I'd have to take a photograph of my TV screen which is of poorer quality. The other screenshots below are also from the MCE 2005 PC and not the MCX, but again they are nearly identical, so the screenshots are still applicable. In any event, let the fun commence. First, I should mention that the Media Center Extender logs onto the MCE machine as its own special user with its own set of special permissions to access Shared Pictures, Shared Videos, etc. It took me awhile to figure out the exact security setup created by the MCX software, but it wasn't too difficult. Ok, now here are my tests of the important features available from the LinkSys Media Center Extender. What I noticed right off the bat was that the "Play CD" and "Play DVD" options were missing from the menu options. Apparently, the MCX respects and enforces digital rights management (DRM), so DVDs and CDs can be played only on the host PC. Yeah, like I'm going to wirelessly share my CD music or DVD movie collection with all my neighbors - c'mon, gimme a break! First of all, my neighbors would need a $299 MCX as well. Secondly, they would have to be within a 100 foot range or so of the WiFi access point. And lastly, they would have to watch the SAME DVD I was watching. Can you imagine the neighbor feuds? For instance, suppose I am sharing Star Wars and I need to take a bathroom break and pause the DVD? All the neighbors would have to wait for my return to "unpause" it. Not only that, but you'd have to call all your neighbors just to inform them which DVD you plan to play. It's just too much of a pain to go through all that effort. It would be easier to just lend your neighbor the DVD or have them over to watch it. So I just don't see wirelessly sharing DVD or TV content with your neighbors as an issue. I hope Hollywood can see the folly of locking down a short-range wireless multimedia transmitter as stupid and let technology proceed unhampered. Further, I should point out that some premium content providers such as HBO have marked their content with a CGMS-A (Copy Generation Management System-Analog) flag which Microsoft respects and therefore limits the playing of premium content, including Video on Demand (VoD) to the host Media Center PC. Thus, I was not able to view HBO on my Media Center Extender. However, I've been told that a software update to be released in late December for the Media Center Extender will allow MCX's to view this "flagged" content. 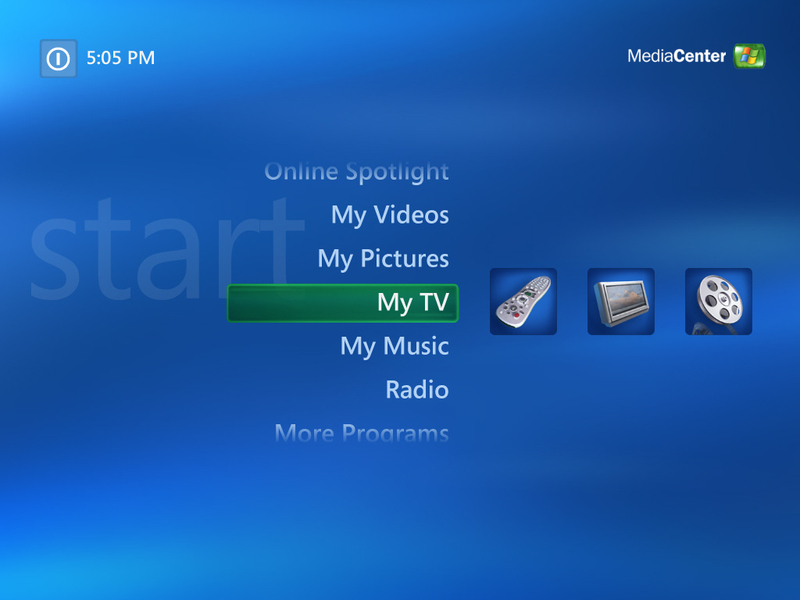 Additionally, I was a bit surprised and disappointed that the Media Center Extender does not support transmitting the PC's Windows desktop GUI, only the MCE 2005's media interface (My Pictures, My Videos, Live TV, etc.) is supported. Thus, using MCE I can not surf the Internet, or even initiate a VoIP call using Vonage's softphone client or Skype - which I had planned to do in my testing. It did seem odd that the Media Center Extender can transmit fast moving, high frame-rate television pictures -- but it can't stream a simple 1024x768 resolution desktop that barely moves? What gives? My only theory is that if the Media Center Extender lets you access the Windows Desktop, then you will be able to launch other applications, such as WinDVD or PowerDVD and be able to wirelessly stream your DVDs thus bypassing copyright protections. Also, by using a $299 MCX and Fast User Switching technology, you can essentially build "inexpensive" Terminal Server clients, which may be why Microsoft doesn't want it. 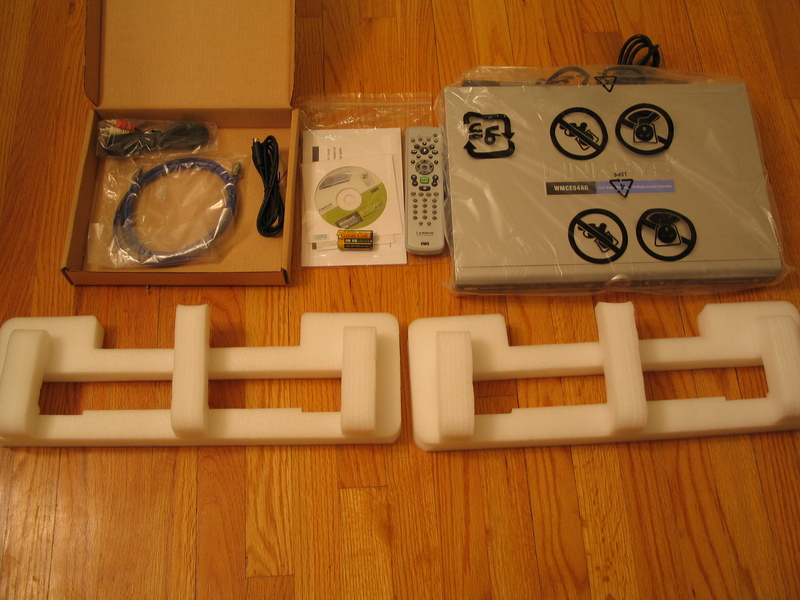 Nevertheless, the advantages and benefits of an Media Center Extender far outweighs the disadvantages. In my tests using the Sony Media Center 2005 PC, I was able to record TV while simultaneously playing music or viewing photos - all streaming the signal over a 802.11g wireless connection. I temporarily moved the MCX to an upstairs TV to test the effect of distance on the wireless connection (and thus the video quality) and I did not notice any degradation in the video quality. I should point out that I only had a single-tuner, so I wasn't able to test recording a TV show while simultaneously watching a separate TV program, however I have seen this work on other Media Center 2005 PCs. I tested both Live TV and Recorded TV on the MCX and played around with the various playback controls for both, i.e. pause, fast forward, rewind, etc. It performed very well, however, I did notice that when I first clicked the fast forward button when watching a recorded program, the TV screen would go black for a split second. It was almost as if the MPEG encoder in the MCX needed time to catch up, or it missed a "key frame". I'd rather see the unit simply "freeze" on the last frame rather than "blacking out" for a split second. I'm sure this is a simple firmware fix to do. Also, when navigating recorded shows, specifically when skipping through commercials it was a bit trickier using the MCX than using MCE 2005. For example, in MCE 2005, pressing the Skip button (30 second fast forward) 5-7 times will quickly skip through all the commercials and if you overshoot it, you simply hit the rewind button. Using MCX you can also do this, but since there is a slight delay in response time, between clicks and seeing the resulting video on screen, it can make finding the right spot a bit more difficult. Regarding "Live TV" in MCX, it is streamed from the MCE PC's tuner card. In a scenario where you have either another MCX trying to change the channel or someone sitting at the MCE 2005 PC changes the channel, and thus are in "conflict" with one another for the same tuner, you will be notified. You can then choose which channel "wins" the channel fight. The notification is "key" since you may be recording something or watching something and don't want it accidentally interrupted. If the kids, husband, wife, etc. decide to override the channel anyway, they can't blame an accidental key press since it required a confirmation key press on the remote control (or mouse-click on the PC). One neat feature of MCE 2005 and supported on the Linksys MCX is the ability to receive instant messages (via MSN Messenger) while watching TV. Of course, if you plan on watching a movie and don't want to be interrupted, you can simply logoff. The MCX unit actually decodes video locally, and as such is limited to the formats that it recognizes. MPEG-1, MPEG-2, and WMV video are supported. However, don't plan on watching your Divx or Xvid video files on the MCX unless you transcode the file first to the aforementioned file formats. (See Update below for a cool on-the-fly transcode method) One really cool feature is that if you are playing a video file and decide to watch Live TV, surf the Web, or any other task that requires you to stop the video, you can actually resume the video where you left off - it remembers. Even if you play other video files and stop them, it remembers the last view point in each video file, so you don't have to worry about remembering where you left off. This is also true for recorded TV video files as well. Many times I would be playing a recorded TV program, see that something else on live TV was about to start, I stopped the video and then played it after the show or even a few days later. If you upgrade from MCE 2004 to MCE 2005 you will notice a new feature called Online Spotlight, which presents third-party content including Napster, CinemaNow, MSN TV, and more. This content includes digital on-demand movies, digital music distribution services, and games. Some of it is free, some subscriber-based, and much of it comes from third-party developers. The photo to the left is of MSN TV, which normally required a paid subscription. Apparently Microsoft decided to be generous and grant all MCE 2005 users "free" access to MSN TV. Or maybe my "free" MSN TV will prompt me in a few months to start paying? We shall see. Nevertheless, I did find myself enjoying MSN TV's videos which include "Play Top Videos", a smorgasbord of the hottest videos covering everything from news to technology. This feature also worked equally as well from the Linksys MCX as from the MCE PC directly, but again with one caveat - you can't use the visualizations feature. So no psychedelic colors warping around on my 65" TV screen! Yet another feature I don't particularly miss, but still worth noting since many people enjoy the music visualizations. What you do get is the default album cover art, track info, and the big background "elapsed time". Surprisingly, you can't fast forward or rewind songs using the remote control, however you can skip tracks using the remote's forward or backward buttons. 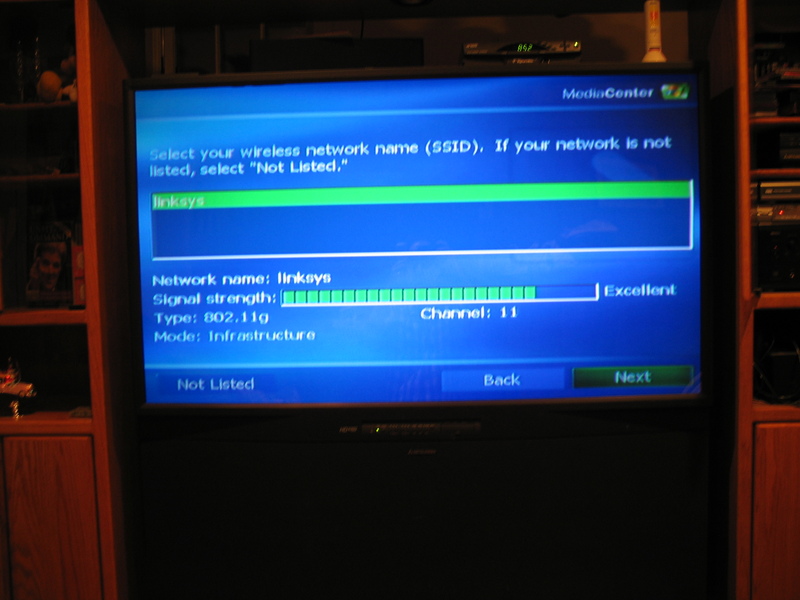 Overall, I loved the LinkSys Media Center Extender - not only was it easy to use, but it allowed me to extend my Media Center 2005 PC multimedia content to any TV in my house without having to drill holes in the walls to snake Ethernet cabling. Not drilling holes in the walls and snaking wires no doubt saved me a few days in my wife's doghouse as well. There is a Microsoft SDK to add other software programs to the MCE 2005 menu interface (which the Linksys MCX will also display). In fact, I added one popular add-on to the menu called "Weather" and it worked flawlessly on the MCX interface as well. Also, since the wireless MCX unit could be fairly far from the main TV room, maybe the MCX unit itself could embed a high quality microphone in the unit itself or even in the MCX's remote control. Again, this is part of my wish list for a future Media Extender. I should state that it took a few days for the WAF (Wife Acceptance Factor) to truly kick in, but now she's just as addicted to Tivo-like functionality as me, especially the ability to fast forward through commercials, as well as the ability to show our photo album to family and friends. In fact, we've become so addicted to the MCE 2005 PC and Linksys MCX, it is not uncommon for her to say to me "Can you fast forward this?" when a commercial comes on. My response is often a chuckle followed by, "Sorry, this is live TV. Can't fast forward this." Enough said. Just got an important email from Linksys / Cisco, which states: Microsoft has released a new version of the firmware for the WMCE54AG. The firmware can be found here: http://www.microsoft.com/mcxsupport for the firmware. - Fixes issue where some audio or video files do not play correctly. - Fixes issue where pressing skip on recorded TV sometimes causes screen to go black. - Fixes issue where waking from standby causes video errors. - Fixes issue where watching video over wireless for extended periods of time will cause video glitches. This firmware is also be posted on Linksys's website shortly. There is now a software solution that enables the playback of unsupported video over Xbox 360 and Media Center Extender devices, including DiVx. So now you CAN play DiVx videos on Media Extenders. The transcoding software is called Transcode 360. I use it - works great. You just have to right-click a video from the MCE Extender interface and choose the transcode option and voila! It will transcode it on-the-fly. IF you want the ability to fast-forward, rewind, etc. you have to give the transcoding time to transcode more of the file. You can simply pause the video and let it transcode for awhile and then you'll be able to fast-forward up to the part where it has finished transcoding. Or you can wait for it to transcode the entire file, so you can fast-forward to any part of the video, but that can take awhile. In most cases you'll just want to watch it through, in which case transcode360 works just great. What I noticed right off the bat was that the "Play CD" and "Play DVD" options were missing from the menu options. Apparently, the MCX respects and enforces digital rights management (DRM), so DVDs and CDs can be played only on the host PC. Yeah, like I'm going to wirelessly share my CD music or DVD movie collection with all my neighbors - c'mon, gimme a break! First of all, my neighbors would need a \$299 MCX as well. Secondly, they would have to be within a 100 foot range or so of the WiFi access point. And lastly, they would have to watch the SAME DVD I was watching. Can you imagine the neighbor feuds? For instance, suppose I am sharing Star Wars and I need to take a bathroom break and pause the DVD? All the neighbors would have to wait for my return to "unpause" it. Not only that, but you'd have to call all your neighbors just to inform them which DVD you plan to play. It's just too much of a pain to go through all that effort. It would be easier to just lend your neighbor the DVD or have them over to watch it. So I just don't see wirelessly sharing DVD or TV content with your neighbors as an issue. Additionally, I was a bit surprised and disappointed that the Media Center Extender does not support transmitting the PC's Windows desktop GUI, only the MCE 2005's media interface (My Pictures, My Videos, Live TV, etc.) is supported. Thus, using MCE I can not surf the Internet, or even initiate a VoIP call using Vonage's softphone client or Skype - which I had planned to do in my testing. It did seem odd that the Media Center Extender can transmit fast moving, high frame-rate television pictures -- but it can't stream a simple 1024x768 resolution desktop that barely moves? What gives? My only theory is that if the Media Center Extender lets you access the Windows Desktop, then you will be able to launch other applications, such as WinDVD or PowerDVD and be able to wirelessly stream your DVDs thus bypassing copyright protections. Also, by using a \$299 MCX and Fast User Switching technology, you can essentially build "inexpensive" Terminal Server clients, which may be why Microsoft doesn't want it.